1998 model Betram 60 Convertible with tower. 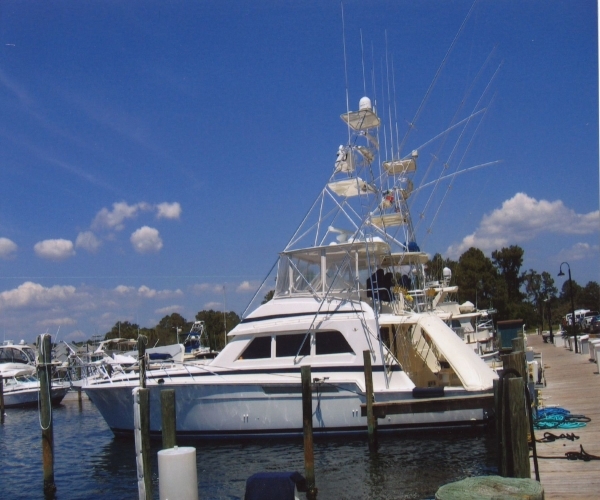 Fishing equipped with triple spreader outriggers, tackle center with freezer, sink, washdowns, transom live well, fish box (plumbed to Eskimo icemaker), rocket launcher, teaser reels. Powered with twin Caterpillar 3412 diesel engines (1300 HP each) with Hynautic engine controls with low hours (3300 hrs) Other equipment includes (2) Northern Lights 20KW diesel generators, windlass, water maker, Mar-quipt davit and chocks on foredeck, twin 50 amp shore service, and complete electronic/navigation package with secondary and repeater instrumentation. Three Stateroom, galley up, interior arrangement. The deck layout provides for anchor pulpit with integral roller assembly, electric windlass, (2) mooring cleats, anadoized aluminum bow/side deck railing, (1) egree/ventilation hatch and (2) ventilation hatches over the fwd accomodations. Mar-quipt electric davit and aluminum chocks are mounted on the foredeck. Superstructure has fixed windows along each side; triple-speader anadized aluminum outriggers, handrailing. 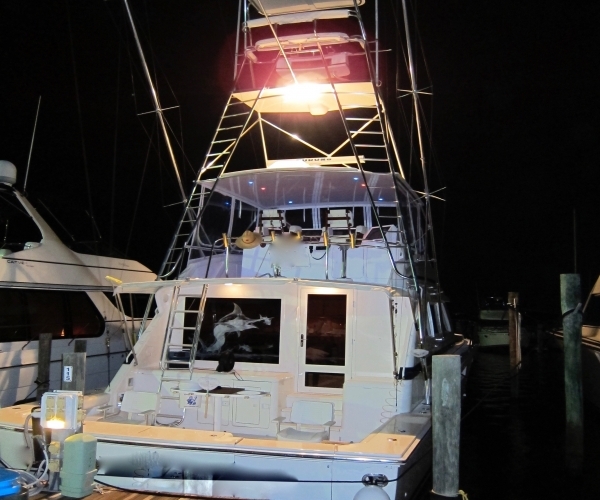 Aft into bolstered cockpit with retractable shelter top, transom door, rocker launcher, tackle center fwd (freezer, sink,stowage) and live well in transom. 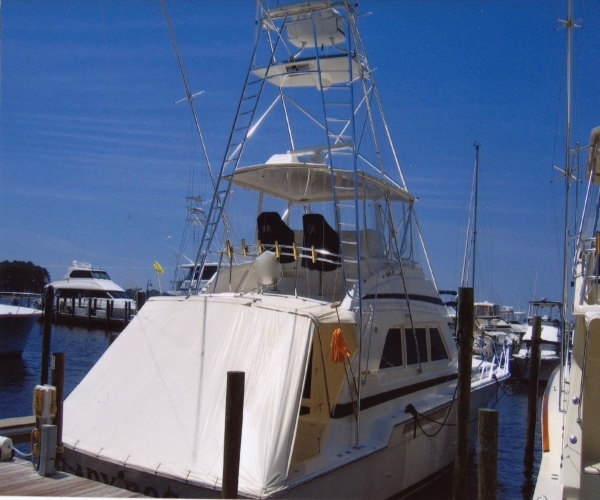 Flying bridge provided with a FRP hardtop and 3-sided enclosure, (2) pedestal seats, guest seating, and stowage forward. Full Tower complete with upper control station. Three staterooms, galley up interior arrangement; in forepeak is a forward with walk around berth, hanging lockers, other stowage; adjoining head area along starboard side. Aft through door into passage with linen locker, washer'dryer locker, and day head along starboard side; on port side is access to the master stateroom complete with walk-around berth, large hanging locker, and adjoining head area; last along the passage is access to the guest stateroom, with stacked bunks and hanging locker. Up and aft is a large galley to port; dinette opposite, Further aft is a large u-shaped couch (storage below) on the port side; credenza along starboard with wet bar/sink and main panelboards with entertainment system. Electronic/Navigation Instruments: Furuno Gp-1850 GPS/Chartplotter, Furuno LC-90 Mark II Loran C, Icom IC-M127 VHF at flying bridge helm, Icom M-54 secondary VHF at upper control, Robertson AP300X Auto pilot, Furuni 72M Radar, Danforth Constellation Compass, (2) Furuno FCV-292 deal frequency color sounders, and Thomas Air Horn.